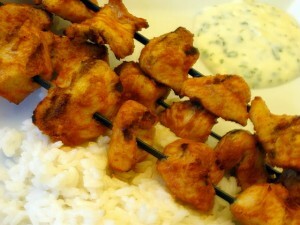 Cheese Chicken Kabab recipe by Nazia Nazar at DesiRecipes.com. Add caraway seeds , green cardamom powder, green chilli paste, ginger /garlic paste, coriander leaves , roasted chana dal powder, turmeric powder, cream and yogurt and mix well. Add cheese, salt , crushed black peppercorns and mix well. Add the chicken cubes and mix. Set aside to marinate for about half an hour. String the chicken cubes onto skewers. Heat a non stick grill pan. Drizzle some oil and place the skewers on it. Shallow fry, turning the skewers from time to time, till the kebabs are golden on all sides. Cover the pan with aluminium foil to ensure even cooking.